Background: Tweaking CHO cell metabolism in fed-batch processes to provide sufficient cellular energy for the synthesis of recombinant proteins at high specific rates forms the basis for achieving superior process yields. Despite the growing understanding of the backgrounds of cellular phenotypes, like the Warburg effect, there is still an unmet need to translate theory into practice. Objective: This study presents a new concept for pool selection, which uses directed metabolic evolution to generate high producer CHO cells with a “low lactate” phenotype. 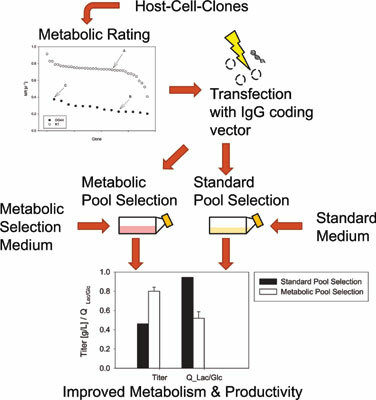 Results: At first, a newly developed indicator called the metabolic rating was used to choose suitable CHO host cell clones for metabolic pool selection. Selected candidates were taken to be tested in distinct metabolic pool selection protocols, which made use of alternating sequences of rationally designed medium (supplemented with, e.g., lactate) and standard medium. The addition of feed medium throughout the pool selection phase was included to increase the robustness of the resulting cellular phenotype. The metabolic selection protocol resulted in a cell pool with improved metabolic efficiency (ratio of lactate produced to glucose consumed was decreased by 1.8x) and increased productivity (1.7x titer increase). The analysis of product quality attributes showed a decreased level of galactosylation but a normal level of high mannose structures and an approximately 7x lower content of IgG1 dimer in the metabolically selected cell pool. After single cell cloning of the metabolically selected cell pool with the best performance and an assessment of resulting clones in a 96 deep well plate, a top clone was identified and tested in a fed-batch process in shake flasks. Titers of 3-4 g/L were achieved using media that were optimized towards copper and iron concentrations. Conclusion: It was shown that the Warburg effect, an effect to be avoided during cell culture-based manufacturing, can be successfully used to drive metabolic selection within the cell line engineering work stream. CHO, cell line development, pool selection, metabolic engineering, directed metabolic evolution, low lactate, IgG, fed-batch.